LifeNets has supported a soup kitchen to feed about 40 street children and orphans in Vinogradov, Ukraine. The children range from being complete orphans to coming from negligent or otherwise dysfunctional parents, or from families so poor that there is simply not enough money for basic nutrition. They are cared for by pastor Vasyl Polichko and his wife Irina who have completely given themselves over to caring for these children. Below are updates about our program. Be sure to read ORIGINAL STORY if you have not done so. Since 2001 This project has been made possible by the perennial financial support from Scott and Carolyn Scharpen of the Scharpen Foundation which supports Christian Sabbath related efforts, and the Rock Valley Christian Church and their friends in Lake Elsinore, California. We are so very thankful for these people whose big hearts have given children on the other side of world speaking a totally different language love and support that they would not otherwise have had. Summer 2013 Mission and Reports/Photos/videos by Participant with links to former missions. Beverly Kubik speaks about Irina Polichko at Puget Sound Women's Enrichment Weekend. See PowerPoint and text of message. Our van is finally brought safely into Ukraine in September 2007 from Germany after a lot of work, support, paperwork, customs etc etc. See more photos. Included are photos from our last visits to the Vinogradov children in January 2007 along with a report from Vasyl Polichko, director of the program. Our van is almost ready to take across into Ukraine for the children! See more photos. We give special thanks to all who helped provide the financing of this Mercedes van conversion into a reliable 20 seater to help transport our children around western Ukraine. The job done has been beautiful. 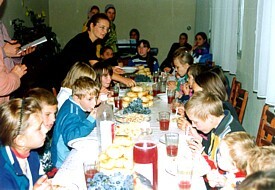 In June 2006 a party of four of us from Indianapolis, Indiana visited the LifeNets sponsored Light of Love Mission for Street Children in Vinogradov, Ukraine. Katherine Rowland (pictured on the right with four of the children) was one of those people. Katherine has exceptional sensitivity and compassion for the vulnerable. Visiting this LifeNets project was a highlight of the entire trip to Ukraine. Please see Katherine's story and photos. We want to thank all those who support this project that LifeNets is sponsoring and now going into its sixth year.